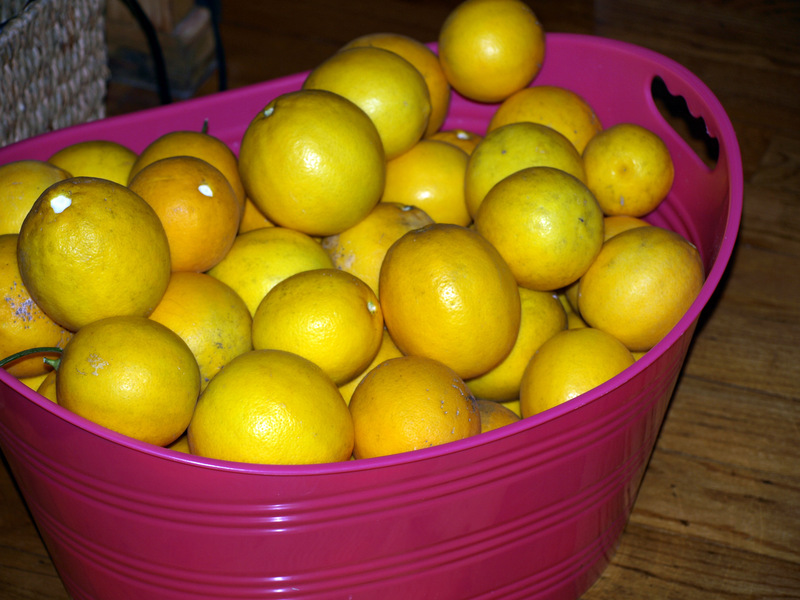 Last winter’s severe cold, a spring drought, and a relatively dry summer led to a massive backyard outpouring of Meyer lemons. My single improved Meyer lemon tree has yielded more than five bushels of fruit, and I’m not done picking yet: the ambitious tree bloomed twice last year, so I have a smaller, secondary crop that won’t ripen until late February. This crazy lemon largesse has me scrambling to use it all: I’m now adding lemon zest to practically everything, sweet or savory, in my kitchen. I have a freezer full of squeezed lemon juice, I’ve given away lemons to neighbors and coworkers, and I’m beginning to consider a lemon road-block in the street outside my house: no car will make it through unless the driver takes a bag of lemons! The time-honored way to address a large harvest, is, of course, by preserving. Jams, jellies, chutney, conserves, relishes: every one was born out of a pile of fruit threatening to decompose. Lemon jam is a lovely thing, but I have been in no mood to spend several hours engaged in the tedious chore of jam-making. Enter the new(ish) instant pectin, allowing the lazy cook (me) to make fruit jams without cooking. Ball’s “RealFruit” instant pectin powder will gel fresh fruits, along with a minimum of sugar. 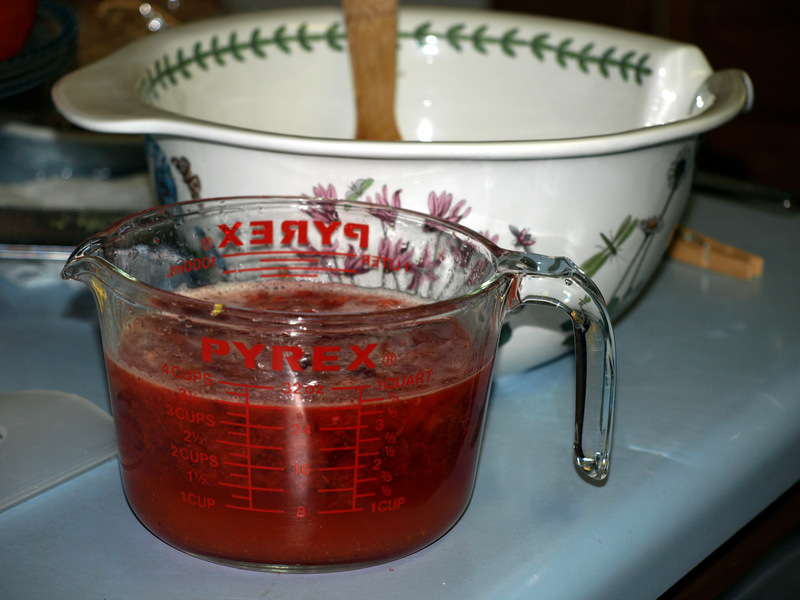 Pectin powder, sugar, and fruit/juices stirred together for three minutes yields a soft-set jam, ready to eat in 30 minutes. The jam must be stored in the freezer (up to 1 year) or refrigerated (up to 3 weeks). Aside from convenience, freezer jam retains the fruit’s fresh, lively qualities, thanks in part to dramatically reduced sugar quantities and the absence of heat. Lemon freezer jam reminds me of lemonade–it’s not a pale, cooked, faint reminder of lemon, but a full-on, tart, nuanced lemony blast. When I checked for possible freezer storage space to stash my lemon jam, I unearthed a bag of last year’s strawberries….and a lemon/strawberry/fresh ginger jam was just a few stirs away. Combine lemon zest, strawberries, and grated fresh ginger in a wide bowl. Mash strawberries using a potato masher, then stir in lemon juice. 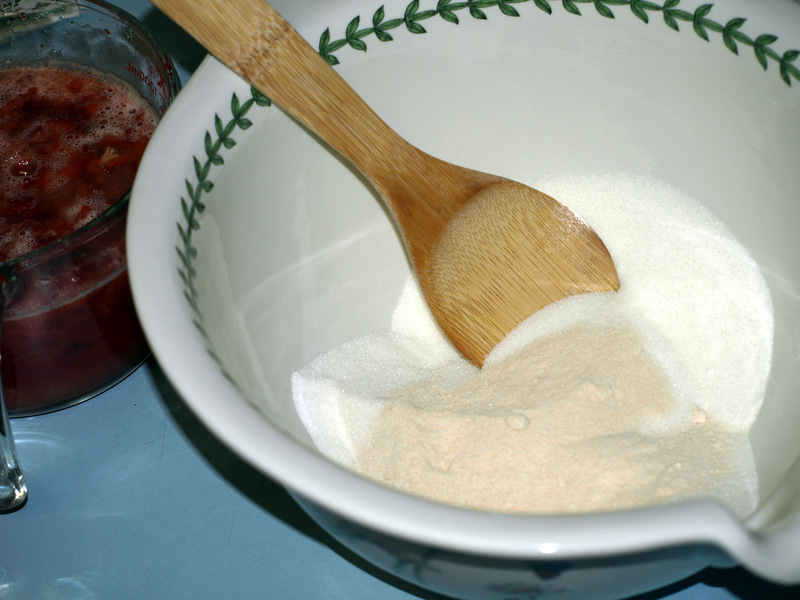 In a separate bowl, stir together sugar and pectin powder. Add fruit & juice to the pectin powder, stirring to dissolve. Stir continuously for three minutes. Fill freezer-safe containers and label. Rest at room temperature for 30 minutes, then transfer to freezer for long-term storage. After opening, store in refrigerator up to 3 weeks. Note: check store shelves near the canning supplies for tall, slender 1-cup freezer jam containers, pictured at left. The wide-mouth containers are easy to fill, the screw cap won’t pop off in the freezer, and the shape fits nicely in the refrigerator door’s condiments shelf. Love this! I got the lemons from 2 of my neighbor’s trees since they don’t use lemons much and it was a bumper crop here in St. Martinville, too. 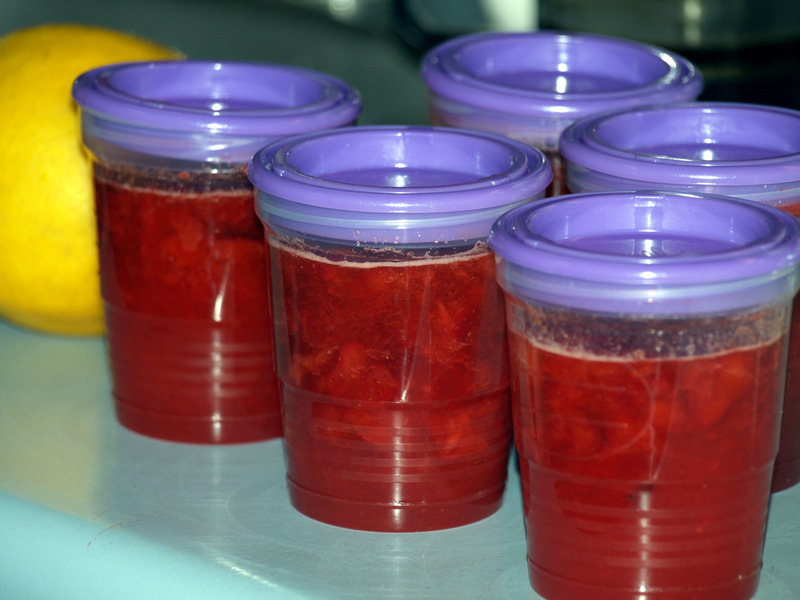 They are all juiced and in the freezer, so I can make this lovely jam anytime I want. Did you know you can salt lemons and store them in glass jars? Salted lemons are used in African, Indian, Chinese, etc., cooking. You can add seasonings, too and even pickle them. I have frozen juice and zest, made Morrocan preserved lemons and made limoncello liqueur and lemon marmalade. I will try lemon jam next! I need to make a batch of salt-preserved lemons. We were in your situation last year with a giant load of Meyer lemons on our tree. Some were damaged in a freeze and never quite the same, but we froze several gallons of lemon juice. This year our tree has borne exactly 17 lemons. We treat them like jewels, but we also bought a case of Meyers at the farmer’s market. Mostly we will freeze the juice, but I intend to make some preserved lemons again, and I may take another stab at candied lemon peel (last year’s attempt was overcooked). We were given sacks of lemons last year when some friends had a bumper crop. I made several different things with them but this Lemon Ice Box Pie was delicious and so easy to make. You could freeze it too I imagine. I used 1/3 less fat cream cheese and lite cool whip. In a medium mixing bowl, beat cream cheese until fluffy. Add condensed milk, lemon juice, and lemon rind. Mix until smooth. Add cool whip a cup at a time and fold in until the filling is to a consistency that you like. Less for denser, more for fluffier. Pour mixture into crust. Refrigerate at least 2 hours before serving. Garnish with whipped cream and mint leaves if desired. I’m also thinking of making a concentrated lemon syrup….wonder how long it would last under refrigeration? Could you freeze it, maybe? In cubes? I still have frozen lemon juice from last year’s crop. Making lemon syrup now. I had a couple socked away to make this puffy lemon tart but my better half went and cooked something with them first. If you have excessive amounts, Hollygrove Market may want them – they have a fruit tree project where they collect produce from trees all over nola. Lemons in January? The only thing we get in January is frostbite! Glad to see you are enjoying your harvest. Might I suggest both limoncello and Moroccan preserved lemons? Meyer lemons work great for both.